Enisey Krasnoyarski kraj (PBL) re-signed 32-year old naturalized Uzbekistani center Julia Kiseleva (200-115kg-85). She played there last season. In 18 PBL games she averaged 8.0ppg, 9.3rpg, 1.2apg, 1.3spg and 1.3bpg. Kiseleva helped them to make it to the semifinals. It was a very successful season in her career as she was selected to Eurobasket.com All-Russian PBL Honorable Mention. 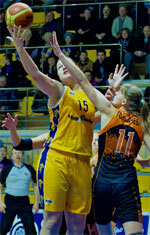 Kiseleva also played 1 game in Eurocup where she had 9 points, 10 rebounds, 2 assists, 1 steal and 2 blocks. Kiseleva also spent pre-season at Dynamo Moscow that year. She can count that season as a very successful as was selected to Eurobasket.com All-Russian PBL Honorable Mention. She has played previously for four other teams: Dynamo Novosibirsk Region, Spartak Vidnoye, Vologda Chevakata and Spartak Noginsk. 12 Irina Averyanova 185-F-84 Barsy Atyr.